Rich fall drink, without a lot of work: Homemade Salted Caramel Mocha. We are entering what I consider peak salted caramel mocha season. 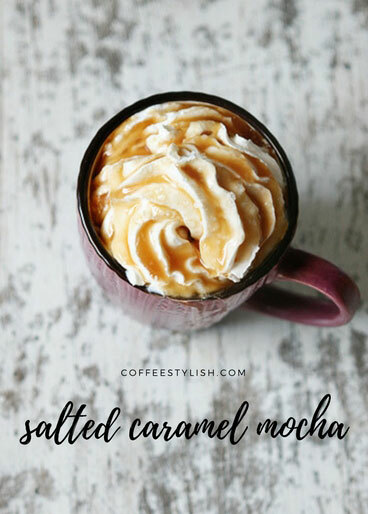 Caramel makes everything better and it’s certainly the case with this salted caramel mocha. I love making them! They taste AMAZING, and like all other recipes on the blog, they are super easy to make. Heat the milk until steaming and stir in cocoa powder/chocolate chips until well blended. Prepare the coffee and add 2 rich tablespoons caramel sauce, and a pinch of sea salt. Slowly add milk mixture to the coffee, while stirring. Taste and add more caramel and sea salt to adjust to your taste. I don’t need sugar, but you can add some if you like your coffee really sweet. Top with whipped cream, a tiny pinch of sea salt and drizzle with caramel sauce. Pull out a double espresso shot, or brew 1 espresso pod. Add 1 teaspoon cocoa powder and stir until well blended. Add 2 tablespoons caramel sauce and a pinch of sea salt. Pour milk into a steaming pitcher and froth the milk. Add milk to the espresso while stirring, taste and adjust caramel sauce/ salt to taste. Dollop with whipped cream, a tiny pinch of sea salt and drizzle with caramel sauce.